With Insights, you can get information and reports for all of the work within any of your projects. It’s like getting a big picture view of everything that is happening in your Brightpod account, with the option to filter and export specific information that you need. Ascending and descending order of dates added or due. Only team members and administrators are able to view Insights and generate their own reports. Pods or People: Select if you want a report relating to your projects or by a specific person. Pods or Clients: Select the pod from where you want to export or you can select the client whose data you want. Team Members: Choose a particular team member whose tasks you need. Date: Specify a period of time. Available terms are- Last 7 Days, Last Two Weeks, Last Month, This Month, or Custom Date Range. 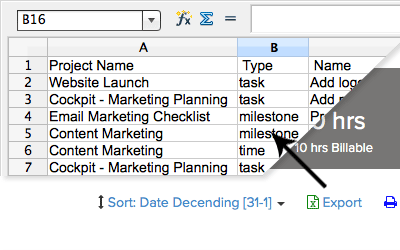 By default, Last 7 days is chosen and you can change it to Custom Date Range to specify a time period you wish. 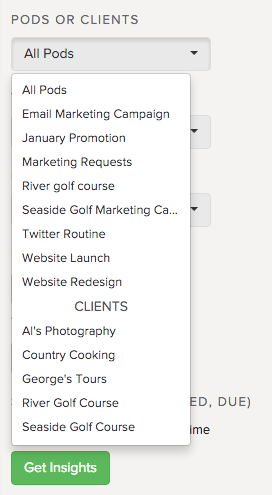 Choose from milestones, tasks and time or select all of them. For example, select tasks and uncheck others to download only the tasks. For a big picture view of your projects, using the Pod filter on Insights is the best way to see what’s happening. 1. On the right side, under get insight on, choose Pods. 2. 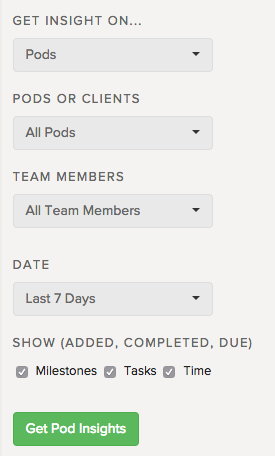 Under Pods or Clients, select the pod you want to check into. 3. For the Date, select Last 7 days as your date range. This report shows all of the activity within that pod. Tip: You can click the task name to open up task details and edit it. 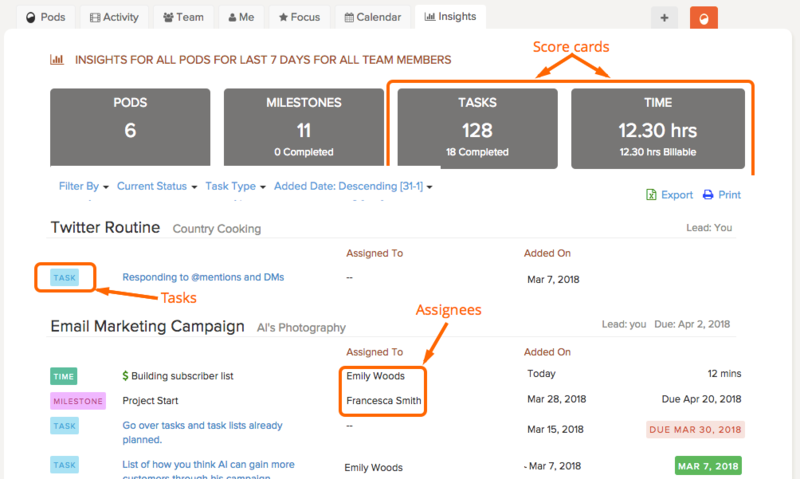 Using filters, you can generate reports of all tasks by pod and/or client, by team member, and date range. There is also the option to filter by overdue, completed, and ongoing. 1. 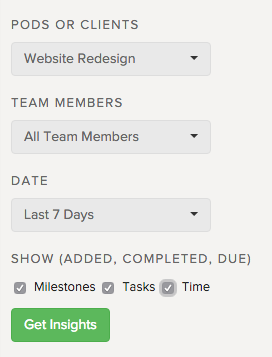 On the right side, uncheck milestones and time leaving only tasks checked. 1. Repeat the above steps to filter by tasks. 2. Under Show All, select Overdue. 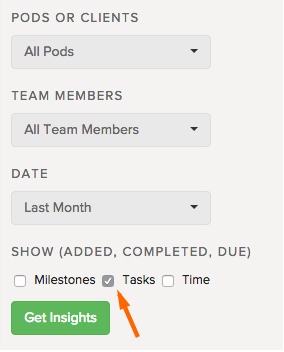 Tip: Instead of overdue, you can select completed to see completed tasks. You can export reports to both CSV and PDF. Look for the options Export and Print just below the score cards and click on it to download the data to your local computer. Export provides a CSV file that you can open the CSV file with any spreadsheet software such as Microsoft Excel, Open Office Calc, or Google Spreadsheets. The activity report will show you when a milestone, task, time was added, completed, due by any of your team members, across any of your projects and during a particular time interval. Print provides a PDF file that you can save or print right away.